University medicine is surrounded by a variety of different social connections which extend well beyond the internal perspective of clinics, research and teaching. Through its day-to-day work, university medicine is part of a tightly knit system of references between many different disciplines. Nevertheless, there are few analyses in the literature which undertake an attempt to place child medicine within its fields of reference to architecture, economics, history or philosophy. The current reformation of pediatrics at the LMU invites a closer examination of the fundamentals of child medicine and a concerted attempt to make these fruitful for the future of the discipline. The "Dr. von Hauner Children's Hospital" of the Ludwig Maximilians University Munich is one of the oldest and most renowned children's clinics in Germany; a center for obstetrics, pediatrics and youth medicine. The planned new construction of this hospital, the "New Hauner" for short, offers the opportunity to illustrate the significance of pediatrics not only in the concrete sense of child health, but also with respect to the horizons of history, architecture, economics and philosophy. In the lecture series "Kinderheilkunde im Aufbruch" (Pediatrics on the Move), renowned scholars addressed these topics during the winter semester 2012/13. This lecture series will be continued in the summer semester 2013 under the title "Das Kind im Zentrum der Wissenschaften" (The Child in the Center of the Sciences). 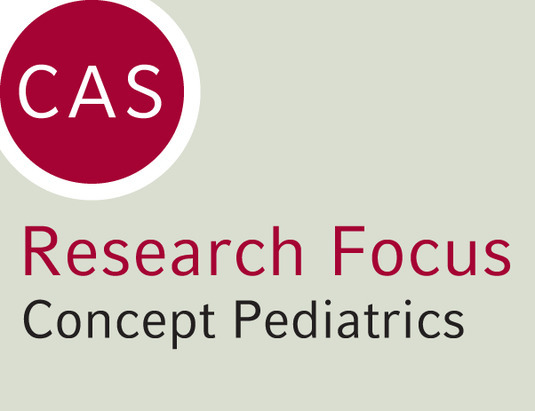 The research focus "Concept Pediatrics – the Child at the Center of Science" is aimed at analyzing the various different social relationships of child medicine. The forum is also intended to play a supporting role in the child-friendly design and realization of the new construction of the "Dr. von Hauner Children's Hospital". Prof. Wendy H Oddy, Ph.D. Participation of Beate Sodian, Markus Paulus and Maria Licita at the Israel Institute for Advanced Studies' Conference in Jerusalem: The Influental Child. Lecture Series in Winter Semester 2012/13 – "Kinderheilkunde im Aufbruch"
International Workshop – "Analysis of Child Growth Trajectories"
Lecture Series in Summer Semester 2013 – "Das Kind im Zentrum der Wissenschaften"
Panel Discussion – "Was sind uns Kinder wert?" Art at CAS – "Das Kind als Objekt der Kunst"
Discussion – "Unerhörte Kinder. Das Kind als Forschungsgegenstand in der Moderne"
Please find video recordings of this Research Focus here: CASVideo – Concept Paediatrics. Analysis of Growth Trajectories, in: Annals of Nutrition & Metabolism 65, S. 95-242. Die großen Nöte der kleinen Patienten, in: CAS Aviso 7 (2013), S. 1-4. Protective particles, in: insightLMU 1 (2013). Caring for the rare cases, in: insightLMU 2 (2013).